High roller players that deposit more than £1,000 will receive £500 free bonus. New players will recieve 150% up to £200 when signing up at William Hill Casino. William Hill will reward you with £50 for any friend who makes a first deposit at the casino. With a streamlined and cool blue aesthetic, William Hill offers plenty of online gambling opportunities to gambling fans- from online, live and mobile casino to poker and bingo room and sportsbook. William Hill Casino is operated by WHG (International) Limited and it is powered by Playtech, CryptoLogic and IGT Interactive online casino software providers among others. The casino is licensed by the Government of Gibraltar. Because of the combination of various software platforms, the casino department offers one of the widest selections of casino games and you can find all your favorite games here in one place. High roller players in particular can enjoy the high limit games like slots, especially those that feature progressive jackpots and hit it big. Next to this, there are many lucrative and premium bonuses and promotions on offer. Security is top priority for this well-known and reputable online casino and it offers plenty of banking options. The customer support team is easy to be reached and because of its international character, the casino is available in 24 different languages. 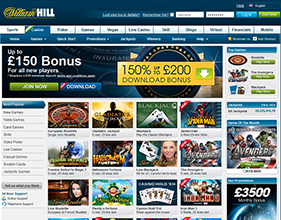 The combination of various software platforms means that the games library of William Hill Casino is one of the largest. To play the games you can either download the casino or use the instant play flash mode. Playtech, CryptoLogic and IGT Interactive online casino software providers offer hundreds of casino games ranging from slots, progressive jackpot games, table games, video poker and more. The game section of the casino is definitely the most diverse. Run by the above-mentioned software developers, the casino games at William Hill Casino are of high quality; the games run smoothly and they are easy to navigate. The graphics and audio are superb and the animations are quite nice. The slot selection is the widest and players can choose from classic 3 reel to 5 reel video slots featuring some of the best slot titles that come with progressive jackpots. To hit the Big One it is suggested to play the maximum bet and high rollers or big fish slot junkies can try out the following high limit slots by Playtech software: Incredible Hulk, Thor- the Mighty Avenger, Pink Panther, Gladiator and Captain America- the First Avenger. The big green creature living inside a scientist from the Marvel comic books has made its way into the online casino industry and has become a 5 reel, 50 pay-lines video slot. Bets start as low as $0.01 up to $5.00. The maximum win is 4,000x your bet. The Incredible Hulk video slot features wild and scatter symbols, expanding wild, bonus round, free spins and four jackpots. Thor- the Mighty Avenger is a 5 reel, 30 pay-line video slot based on the mythic Norse Thor, also known as the God of Thunder who has a huge hammer which he uses to create lightning. The betting range starts from $0.01 to $30.00 and the game comes with wild and scatter symbols, an extra symbol, three extra rewarding features and, of course, four jackpots. Pink Panther is a 5 reel, 40 pay-lines video slot. Bets start as little as $0.01 up to $20.00 and the maximum win is $100,000. The slot is based on the comedy series of the 1960s in which inspector Jacques Clouseau tires to find the Pink Panther. The game comes with wild and scatter symbols and bonus features. Based on the same movie featuring ancient Rome and its epic warriors, the Gladiator is a 5 reel, 25 pay-lines video slot whose betting range starts from $0.02 up to $250.00. The maximum win is $1,250,000 and the slot comes with wild and scatter symbols, bonus round and a multiplier. Captain America- the First Avenger is a 5 reel, 20 pay-lines video slot based on the same movie where a solder from the army leaves his uniform and transforms into a super hero. The game features wild and scatter symbols, bonus feature with expanding wilds, a multiplier and free spins. Additionally, there are four progressive jackpots. Next to the high limit slots, high rollers can hit the high limit table games like Roulette, Blackjack and Baccarat. Not only there are a couple of variants of each game, but the same games can be played in real time. If you are a fan of online casino gaming but prefer to chat with the dealers in a true-to-life environment, the live dealer casino games are perfect for you. Additionally, if you are on the go, you can play high limit games on your mobile device, thanks to the William Hill mobile casino. High rollers can take advantage of the £300 bonus on their first deposit and enjoy the “free cash”. All other players can claim the 100% first deposit bonus up to £150 and any returning player can use the 75% second deposit bonus up to £100. If you refer a friend you will also get £50. In addition, William Hill Casino also gives away £3,500 monthly loyalty bonus which is 20% up to £175 per deposit. 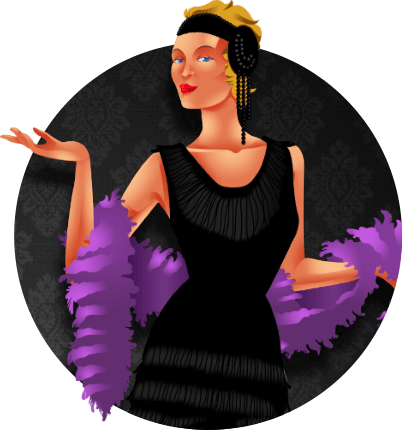 Once you sign up with the casino, you will automatically start earning comp points. Each £10 wagered is worth one comp point and these points can later be redeemed for cash. The comp point exchange rate depends on your VIP rank. 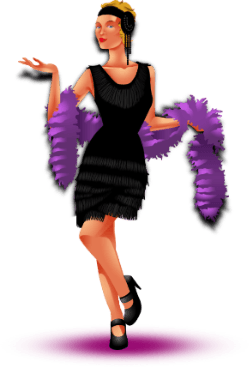 A high VIP ranks means that you will enjoy improved bonuses, private tournaments and many other red carpet luxuries. At William Hill Casino all transactions are securely carried out over 128 bit SSL servers. This means that all your sensitive data is well-protected. In addition, the casino games are certified for fair play and they are indeed random. The casino’s customer support team can be contacted via UK toll-free phone number and fax, while players from Greece, Germany, Spain, France, Russia and Austria can contact a representative in their own native language, also via toll-free phone numbers. Additionally, if you have any inquires or problems about a bonus or a game, simply contact the customer support through e-mail. William Hill Casino has established itself as one of the best online casinos in the industry. The combination of different software and the range of quality games are good. High rollers in particular can enjoy high quality game play at high limit slots, bet the maximum and hope to hit the Big One. Additionally, they can take advantage of the high roller bonuses. The tempting bonuses and promotional offers, particularly the ongoing offers, are competitive. Another benefit is that players can use only one account across a number of sites. On top of this, money transfers are processed quite fast and all this is done in a safe and secure environment.